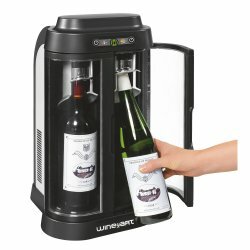 This user friendly system helps you serve and preserve your wine. The Wine Art preservation system works to enhance your wine's flavour, and serve it at the exact right temperature every single time. 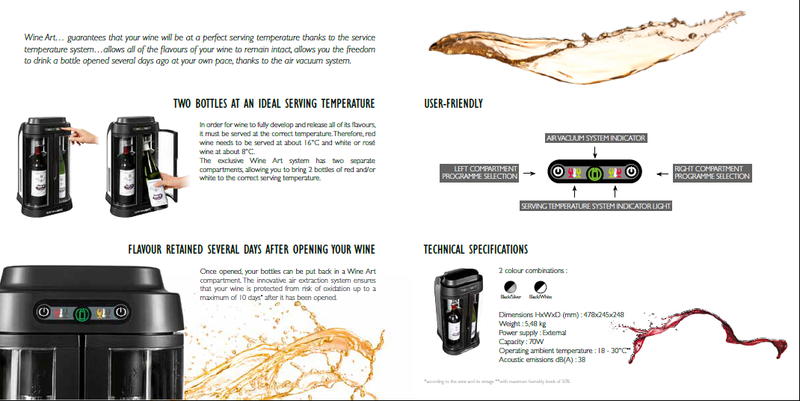 This system is designed to extract air right from the bottle to ensure that your wine does not oxidize and spoil. Store up to two wine bottles at the ideal temperature, and make sure you never have to worry about preserving or serving your wine properly ever again! Please note, 1 1/2 to 3 hours cooling time is required to bring wine bottles to the desired temperature. Times will vary based on the starting temperature of the wine and desired storage temperature. 6 to 8 degrees Celsius for white wine and 16 to 18 degrees Celsius for red wine, are fairly standard storage temperatures for immediate drinking. Usually available within a week, we consider these as a special order item.